Setzt Spieler die "afk" in den Chat schreiben in Spectator. 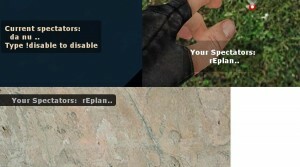 When you want to go AFK simply type "!specme" into chat, upon return simply join a team as per usual. *NOTE* if the server has not changed maps when you return your score will be the same as what it was before joining the spectators team.